The Club talks to each other. Chris Jericho talks to himself about “it” in a mirror and wonders where his scarf is. Sami Zayn wonders what will happen when he beats Jericho. Seth Rollins arrives at the arena and tells the truth to Jey Uso. Jojo is in the ring and begins to introduce the first match when Dean Ambrose interrupts. He wants to be a ring announcer. Pretty good match. Dean Ambrose kept interjecting on the mic with various announcements for the crowd which was kind of amusing. Rollins never really seemed to be in trouble in the match though. Still, Jey Uso held his own and kept the match at a good pace. Pretty good match. Ryder got beat up for most of it, but it was entertaining and I liked the finish. Tom Phillips stops Ryder on the stage and asks him “what’s next.” Ryder says that he wants to go after the US Title and officially challenges Rusev. Greg Hamilton asks Rusev for his response to Ryder’s challenge. Rusev wonders what’s wrong with him. He also accepts. Becky Lynch makes her way towards the ring for a match but gets attacked on the ramp by Natalya. She puts Becky in a Sharpshooter on the floor. Clips from RAW where New Day accepts the Wyatt’s invitation, and clips of Xavier Woods from WWE.com talking about how he isn’t happy about facing the Wyatt’s but that he’ll stand by his brothers. Enzo Amore and Big Cass head to the ring. They explain that they helped Cena on RAW to send a message to The Club that they can’t just go around beating people up. The Club quickly comes out and wonders what they should do. They decide that they should beat up Enzo and Cass. Specifically, AJ wants to shut Enzo’s mouth. AJ dominated and Enzo did what he usually does (get beat up), but it was a good match. There were some outside shenanigans, but it didn’t affect the match. Jericho is still looking for his blue scarf. Kevin Owens has it, and he got popcorn grease on it. The Vaudevillains, Kalisto, Titus O’Neil, and Dolph Ziggler were watching the video of Miz at the center of the food fight from RAW. The Miz calls “cut.” And Maryse can go wherever she wants. Kalisto then challenges Miz to a match, and Maryse accepts. Fun match. Kalisto did most of the work, running and jumping all over the ring. For the most part, Miz just had to absorb punishment and avoid what he could until he got the chance to hit a couple of big moves. Bob Backlund tells Darren Young how to deal with problems. Golden Truth does a commercial for Sonic’s Boom Box meal. Good match. Both guys did what they do best, and the tension between Zayn and Owens helped add an extra layer to the match. Owens on commentary didn’t hurt either. After the match, Jericho attacks Zayn and leaves him for Owens. Owens hits a pop-up powerbomb on Zayn to end the show. An okay show with a good main event. Even though I liked most of the matchups, most of the rest of the wrestling was just kind of so-so. More than usual, this episode felt a little like an afterthought. Like the writers didn’t have any strong ideas so they just put together whatever so long as it didn’t interfere with any of the main stories. 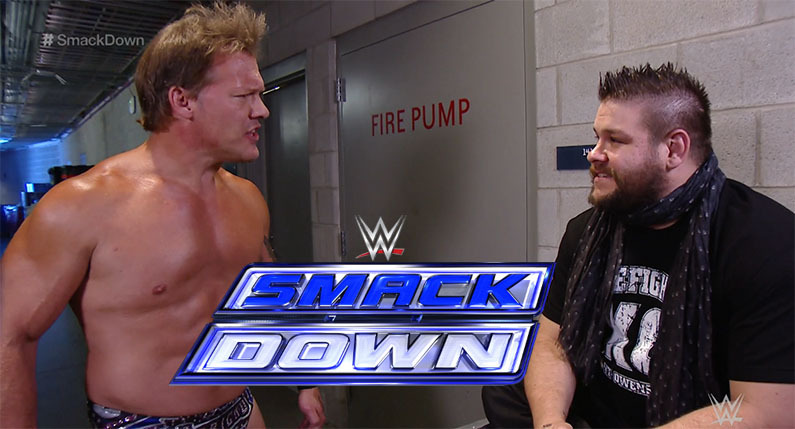 I liked the interactions between Owens and Jericho though. As always. Easily the best match, though I know they could do even better, especially if the feud was between them and not Zayn and Owens.